In 1648 the town’s citizens were caught up in the conflict between the Royalists and the Parliamentarians. They suffered starvation, economic disaster and heavy fines for their, albeit mostly involuntary, involvement. 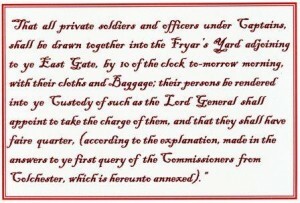 In the first connection, Grey Friars is mentioned in the Articles of Agreement governing the conduct of the surrender on 27th August 1648 shown below. The ‘first query’, which read “What is meant by rendering mercy?” was answered as follows: “By fair quarter we understand, that with fair quarter, for their lives, they shall be free from wounding or beating, shall enjoy warm clothes to cover them, and keep them warm, shall be maintained with victuals fit for prisoners, whilst they shall be kept prisoners.” The senior soldiers were afforded much less mercy. 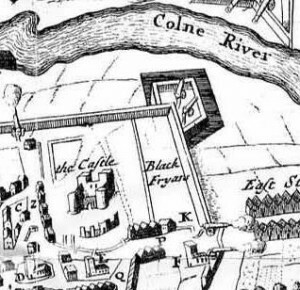 Note: in the map the Grey Friars site is mistakenly labelled “Black Fryars” as the diagram was probably based on Speed’s original map of 1610. ‘K’ marks the “Friars’ yard”, now approximately where Roman Road meets East Hill. It also shows an intriguing convoluted front boundary line seen in earlier maps. Such an arrangement, which may have something to do with the juxtaposition of the remains of the friary wall, Roman wall, eastern gate and guardhouse, could indeed have formed what may be termed ‘the friars’ yard’. This was, of course, only a convenient name, for the friars were long gone by this time! 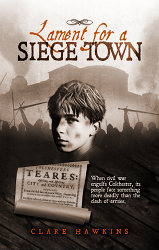 NEW NOVEL … … Based on one of the most harrowing episodes in the history of Colchester and the English Civil Wars, this is a story of human endurance and the cruel consequences of conflict, for victor and vanquished alike. It’s 1648 and the forces loyal to King Charles I are defeated; the English Civil War is over, but some would not have it so. Leading a resurgent Royalist army, Sir Charles Lucas enters the Parliamentarian town of Colchester in Essex. But the enemy, Sir Thomas Fairfax’s undefeated New Model Army, encircles the town. In the pitiless siege that follows, Katherine Wade, bound to a husband she loathes, discovers a perilous form of liberation. Beth Sayer, an impoverished weaver’s daughter, fights for the survival of her family and Tobias, a wounded soldier, must choose between duty and love. “I worked in education for 36 years in various settings, from teaching English in secondary schools to co-ordinating adult classes for the WEA. Over the years, I attended a number of courses in creative writing, but commitments to family and job left little time for writing anything substantial. However, retirement from paid employment offered an opportunity to try and write a novel.